Last year we unveiled the first is a new series of patches created in collaboration with New Orleans-based artist Marrus, featuring her Demon Fae characters. Today we unveil the next in the series! Rock-a-Bye, featuring a Demon Fae lying upon a twisted tree branch, is based on original artwork by Marrus, and our embroidered interpretation is 100-percent Marrus approved! At 6.25 inches in diameter, this is no mere patch; this is a work of art suitable for framing and displaying in your home or office (although you can of course put it on the back of a jacket and really catch everyone’s attention). 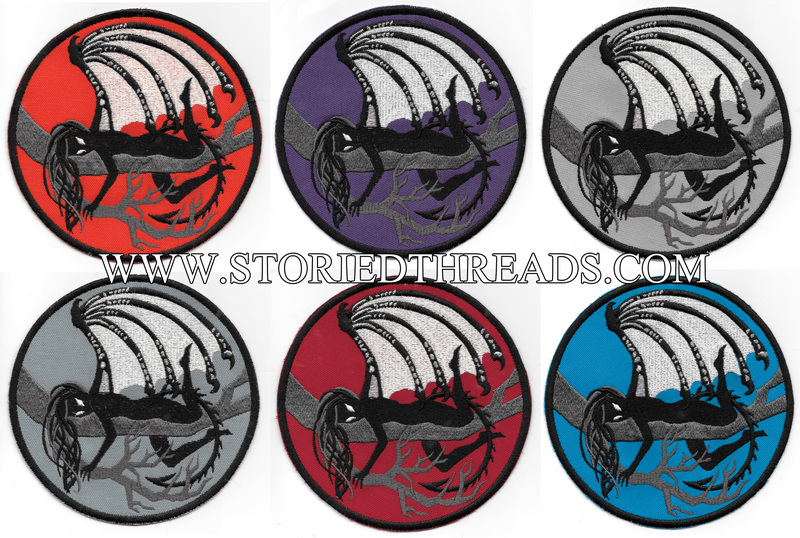 The Demon Fae – Rock-a-Bye patch is available through our web store for $36 plus shipping, and is available with six different background colors: red, orange, light blue, teal, purple, and light gray. Final Call for Retiring Designs! January is almost over, which means this is your last chance to grab certain patch and accessory designs. We will officially remove the listed items below from our website and our Etsy shops at the end of the day tomorrow, so act now if you want any of these! All items will be retired! Community – Troy and Abed in the Morning! Galaxy Quest – By Grabthar’s hammer, you shall be avenged! Rosencrantz and Guildenstern are Dead – We’re actors — We’re the opposite of people! 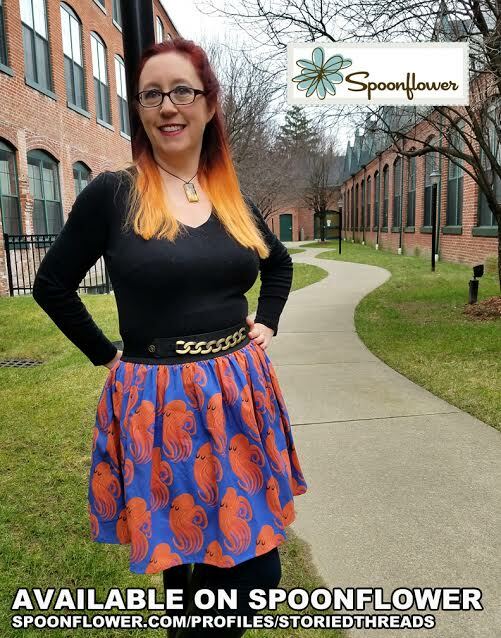 This week we’re adding a new design to our Spoonflower shop, based on our Kawaii Octopus patch. Available in a variety of fabric types, the Kawaii Octopus (also known as the Happy Deep Sea Octopus) features, as the name indicates, a happy octopus rendered in bright orange floating peacefully on a sea-blue background. The Kawaii Octopus fabric begins at $17.50 a yard for basic cotton. It’s no secret we here at Storied Threads are avid readers and draw a lot of inspiration from our favorite books — and we’re definitely in a literary frame of mind as Boskone, a Boston-based convention that focuses heavily on genre literature, is coming up in a few weeks. 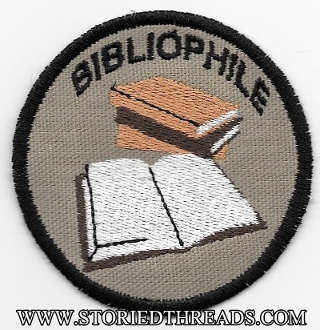 So this week we’re spotlighting some items that should be of interest to our reader friends, starting with the Bibliophile Geek Merit Badge ($7). We also offer variations of this design on an embroidered bookmark and on a messenger bag. FYI, we haven’t made tablet or laptop sizes in this design yet, but if that sounds like something you or a fellow reader would be interested in, drop us a line and ask about a custom order! 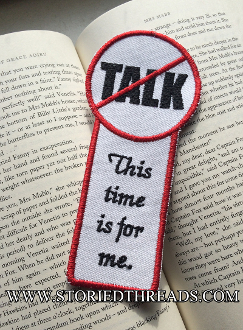 Speaking of bookmarks, we have several designs listed in our Literature section, but I’m going to spotlight the “Me Time” bookmark ($8). We came up with this idea after hearing a lot of stories — too many, in our opinion — of people being harassed in coffee shops and on public transit while they were just trying to sit and read in peace. Make sure the top of this bookmark is peeking out and send a clear message that you’re not there to chat, you’re there to read. While we honor several great authors, we’re going to pick on Edgar Allan Poe for our final item, a messenger bag bearing the most famous line he ever wrote, from the poem The Raven ($34). 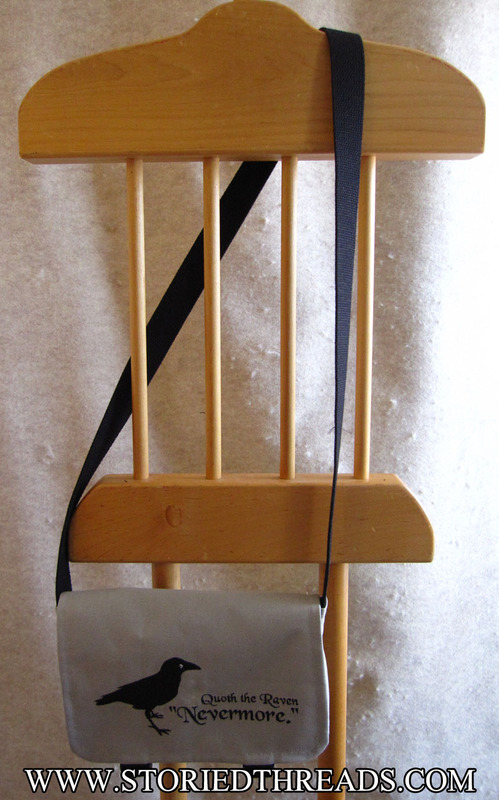 As it happens, the basic messenger bag is the perfect size for holding a hardcover or trade paperback size book! Remember, these and other designs are also available as stickers, laptop skins, T-shirts, and more at our Redbubble store. Subscribe to the Stored Threads Newsletter! Now that we’ve retired from doing conventions and faires, Storied Threads’ monthly newsletter is the most reliable way to learn about new designs and keep up with us throughout 2017. Not a subscriber yet? No problem! Just click the link below to sign up. We promise not to share your information, or to spam you with daily messages. Last week I unveiled in my Redbubble shop’s photography design section a piece using a photo I took while enjoying my holidays on the Jersey shore. As promised, here is the second new design from that vacation, a simple still life featuring some seashells I collected while walking the beach with my dog Beatrix. This image looks great on graphic print T-shirts, laptop and tablet skins, a tote bag, or as straightforward wall art. 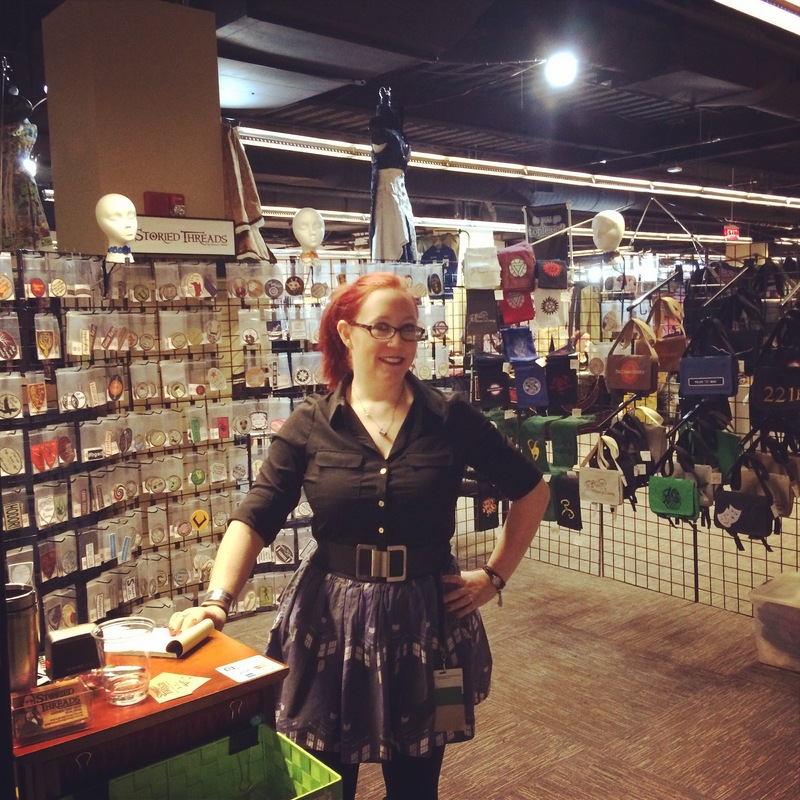 This weekend is Arisia in Boston, and it’ll be something of a bittersweet show for us, because it’ll be my first Arisia in four years as a plain old patron. 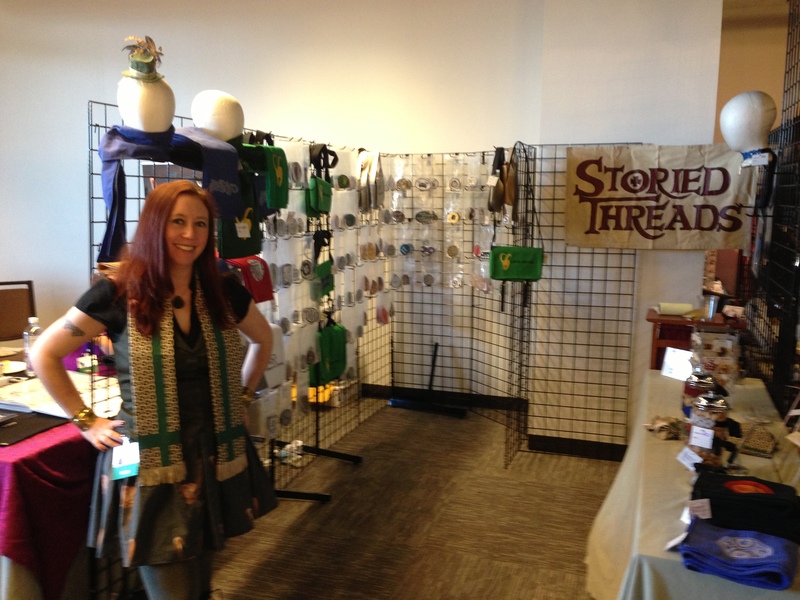 My first time vending Arisia was in 2013, and as you can see from the photo at right, my setup was a LOT smaller than it was by the end of my run (bottom photo). We had a much smaller catalog of items and, as you can tell, my arrangement was a little weird, but we did all right that first year, and Arisia quickly became one of my most reliable shows.